(800) 782-7167 Option 3 (580) 252-2900 Ext. 240 Our hours of operation are Monday to Friday, 8:00-5:00, and our offices are located in the north wing of the Simmons Center, 800 Chisholm Trail Parkway in Duncan. Every so often we send out emails with information about exclusive getaway ideas, contests, unique places to see, and things to do in Duncan Oklahoma — right to your mailbox! So go ahead and subscribe…and while you’re at it, please tell us a bit about yourself; this will help us deliver relevant travel tips and escape ideas. You can always check out the latest issue of the Visit Duncan newsletter too. “RSS feeds” (a.k.a. ‘Rich Site Summary’ or ‘Really Simple Syndication’) allow you to get the newest news or content from a website as soon as its published, without having to visit the websites you have taken the feed from. VisitDuncan.com offers a couple different RSS feeds for use in news readers and personal pages such as your “My Yahoo!”, “iGoogle” or your personal blog. These feeds include headlines from our blog, summaries of upcoming events and links back to our site for the full article. These feeds are free and are updated as frequently as the corresponding content on our site. To start using feeds, you need a “news reader”. This is a piece of software that checks the feeds and lets you read any new articles that have been added. There are a range of different news readers available. RSS-Readers.org has a pretty up-to-date list. The Duncan Convention & Visitors Bureau invites you to submit or update a website listing. This totally FREE listing is a great way to advertise with the DCVB. The more information you provide, the more easily a visitor will be able to find your business. Please submit a logo and up to three photos for inclusion along with your descriptive text. You may also submit a menu or brochure that visitors can download from the website. We must be able to contact you by phone to verify this information. You must provide this so that we can email you back with confirmation. Insert your official website, facebook page, twitter page, or even a Yelp! location address. Descriptive text should be no longer than 500 characters. If there are any problems with the files we will contact you directly to determine the best way to get us the files. We prefer vector logos (.eps or .ai files) or high-res (300dpi) bitmap logos with transparent backgrounds (.png, .tif, or .psd files). Please do not attempt to upload logo files over 5 megabyte (MB) in file size. Only upload photos that are high-res (300dpi) bitmap images (.jpg, .png or .tif files). Each photo upload may be between 1 to 5 megabytes (MB) in file size, however the form will not accept photos over 5 megabytes. We can only accept Adobe Acrobat files (.pdf) that are less than 10 megabytes (MB) large through this form. Please do not attempt to upload files over 10 megabytes as the form will not submit. (required) By checking this box, you understand that your information will be collected along with your IP address, and consent to receive information from Visit Duncan and the Duncan Convention and Visitors Bureau with regards to this discount submission. 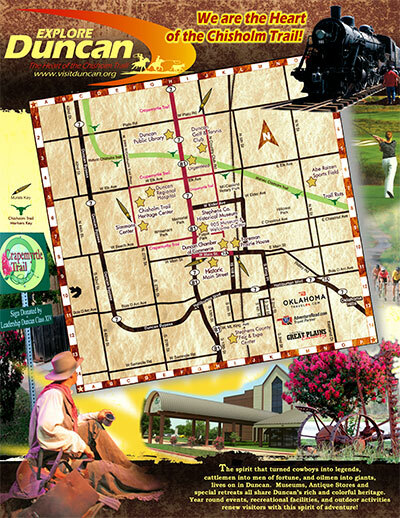 The Duncan Convention & Visitors Bureau invites you to provide a coupon for our visitors to use while staying in Duncan. These coupons are a great way to drive traffic to your business. We accept coupons for attractions, activities, arts, dining/nightlife, accommodations, transportation (nongroup), and shopping discounts. If you have a pre-designed coupon, please upload it with the following form. If you do not have a predesigned coupon, please fill out as much information as possible so that we can create a Duncan CVB formatted version for our website. You must currently have a Duncan-based business listing with us. If you do not, please create a listing first before submitting your coupon..
We must be able to contact you by phone to verify this information. This information is also used for contact information with the coupon details. This is the main discount message (e.g., "$5.00 off purchases over $25.00", "Glad you're in town discount - 20% off all items", "Free soft-drink with purchase. ", "Happy Hour - $2 Beverages after 5pm before 7pm", etc.). Text should be no longer than 250 characters. Stipulations for the discount or deal should outline what the extra limitations there are on this discount (e.g., "Not for use on weekends", "Must provide proof of home address", "Regular price items only", "Available on the following items..." etc.). Text should be no longer than 500 characters. Please note that we may convert or modify the file to fit our website specifications. If there are any problems with the files we will contact you directly to resolve any file concerns. If you do not have a pre-made design file of your discount coupon, we can create one using our default templates. We prefer vector logos (.eps or .ai files) or high-res (300dpi) bitmap logos with transparent backgrounds (.png, .tif, or .psd files). Please do not load logo files with a file size larger than 5 megabytes (MB).